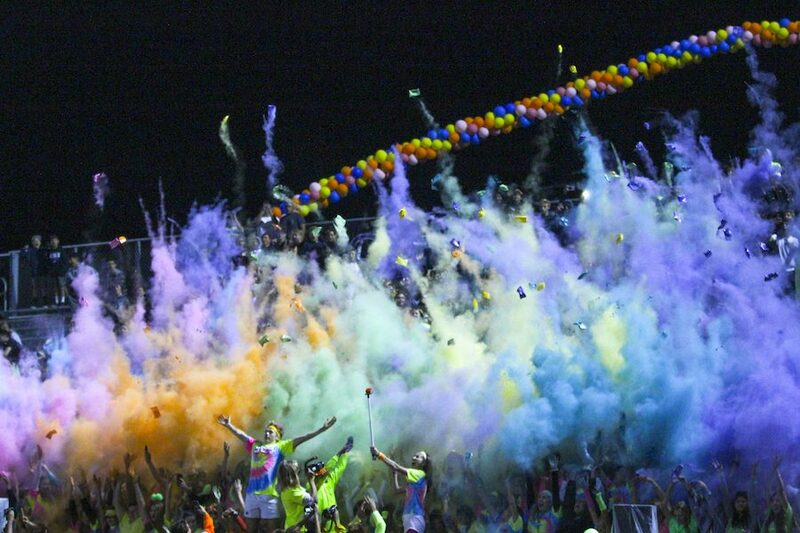 Loud crowd throws neon powder up to celebrate last home game. Varsity football wins their last home game before CIF finals 48-44. On May 12 CHS won the title of “America’s Most Spirited High School” and Mr. Muilenburg was named the most spirited teacher in the nation. We decided to look into what makes our school so spirited and what this award means for CHS. 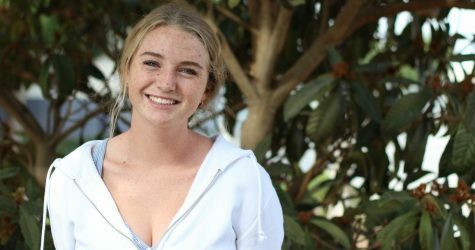 As our school won the most recognition for the most spirited school, Carlsbad High School gained a positive reputation in San Diego County and received comments from celebrities. 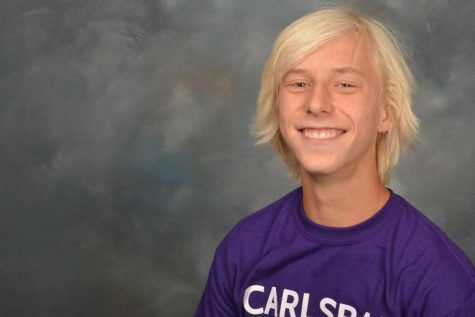 On May 12, Carlsbad High School won the award for the most spirited school in the nation. 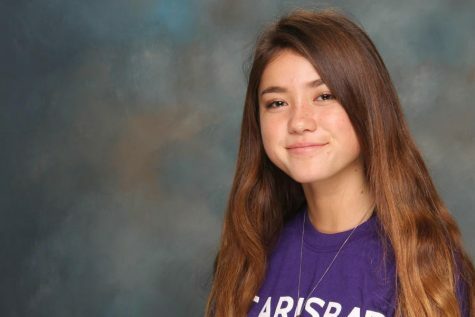 Videos and photos were submitted to showcase the school spirit and pride that ASB has encouraged onto CHS students. Along with the recognition as the most spirited school, ASB nominated the most spirited teacher and administrator for supporting our students. Our school gained their momentum by winning initial awards, such as Battle of the Fans this year, from local competition. Therefore, ASB decided to enter the national competition which is the varsity brands. Along with the awards given to the high school as a whole, there have been awards given to teachers that reciprocate the spirit of the students. Mr. Muillenburg was named the Most Spirited Teacher in the Nation which was a result of the student body nominating him. Since everyone was aware that our school won the most spirited school in the nation, Mrs. Redfield was nominated the best spirited administrator for attending our school events and supported our school. She is the one of the administrator that students felt supportive during any games. 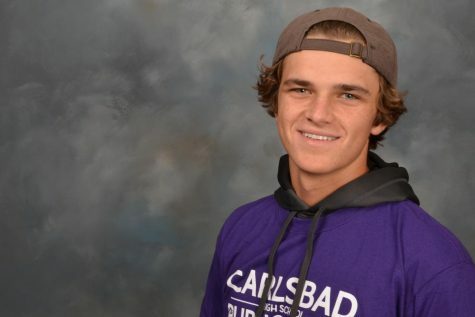 The obstacles that our school has to face are the students who are uninvolved in any school events, and ASB managed to overcome these difficulties, which is why Carlsbad was recognized as the most spirited school throughout the nation. For example, CHS won because students are spirited by attending homecoming game to support our team. 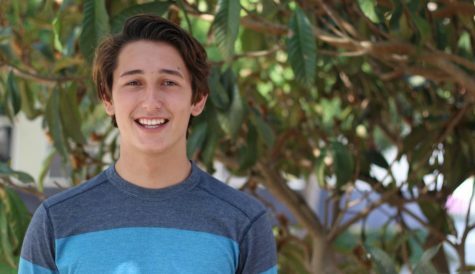 As our school won for the most spirited school, CHS gained a positive reputation in San Diego County and received comments from celebrities. Therefore, lancers as a whole become recognized by the whole community. Mr. Muilenburg won this years "teacher of the year" award. Muilenburg is seen here instructing students of his AP environmental class how to properly analyze a mortality chart. The growth that occurs during a students life is very dependent on who they have influencing them as they are growing up. Parents, friends, and teachers that a person is surrounded by can either help or harm their future successes. Teachers are a category of people that take a huge part in hundreds of kids life development each year. 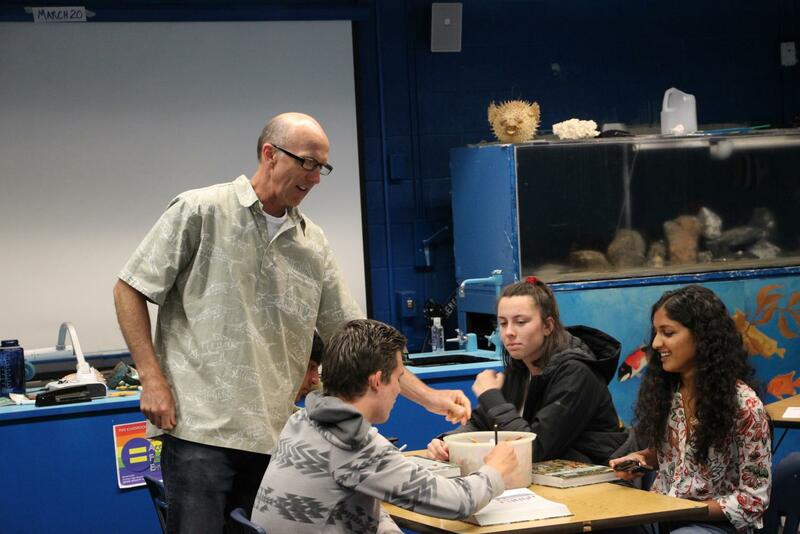 Mr. Muilenburg has been awarded “Teacher of the Year” for his extensive work towards the science program. Science classes can be one of the required classes that are dreaded by some students. Senior, Rachel Whitehead, likes that her CP Marine class is not one of the classes that she dislikes going to. Something that makes Muilenburg such a unique teacher is his use of field trips and hands on learning. The students take field trips to further increase their understanding of what they may be learning at that time. Not only are these field trips more intriguing than sitting in a classroom, but they also allow people to comprehend the topic in different ways that might work better for them. Most students around campus know Muilenburg for his wide selection of reptiles and animals in his room. Of course these animals are fun to be around but they also apply to what Muilenburg is trying to explain to the class. Anyone who takes Muilenburg’s class is guaranteed new learning opportunities and experiences for their education. His award is well deserved based on how many students enjoy going to his class. 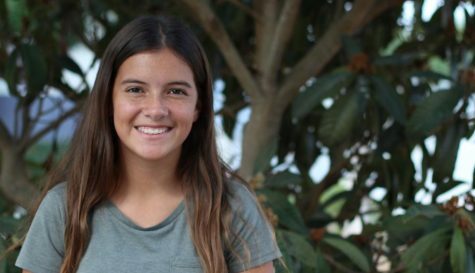 Students share why they believe CHS is the most spirited school in America. 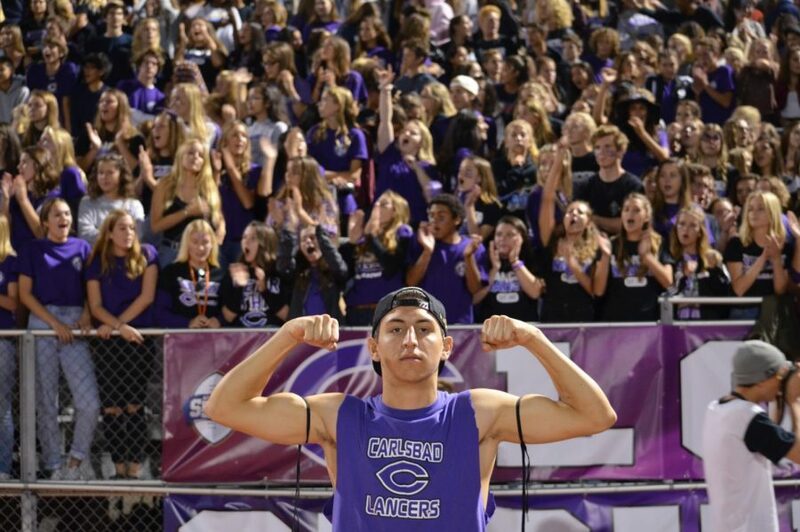 Senior Chris Weedman flexes for the camera, as he stands in front of hundreds of students in Loud Crowd. Students were all wearing purple for the homecoming game. High school is a big, scary and frustrating place. Being plopped into a whole new world with new people, new places and new responsibilities can be quite terrifying. The new enviornment is difficult to navigate and often leads to feelings of complete isolation. The period of time where you are trying to figure out how you fit into the fabric of your school is long and frankly nerve-racking. 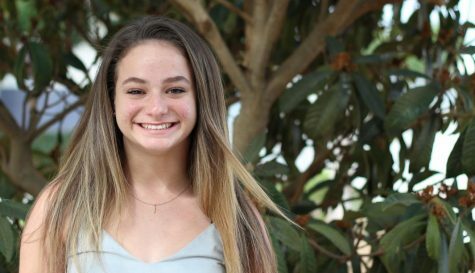 Yet, high school students of all ages tend to ignore the simple remedy of school spirit that combats the fears and difficulties that come along with high school. 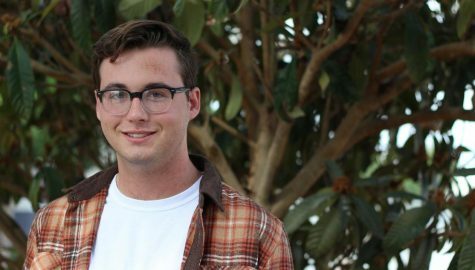 Unfortunately, many students view school spirit as a phrase thrown around by organizations to garner more attention for events, but little do they know the term reaches much further. The amount of school spirit an individual holds often translates to improved academic performance and overall mood. In a study conducted by Varsity Brands, the organization that named CHS “The Most Spirited School in America”, it was found that parents with school spirited children reported above average academic performance 61% of the time, while parents with children lacking school spirit only reported above average performance 31% of the time. This correlation is likely due to the fact that when students feel a sense of belonging on their campus, they feel more supported in pushing themselves academically. Aside from academics, school spirit encourages students to get involved with more school clubs and organizations. Having a sense of pride and understanding for the community at your school leads to a desire to contribute. Joining in on activities around campus opens up oppurtunities to meet new people and connect yourself to others in the future. Participation in school can allow you to uncover a new passion or make lifelong friends. Having pride and displaying improves the four years you spend in high school and even enhances the time you have after graduation. 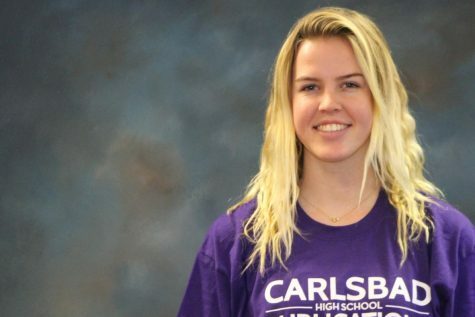 Whether it’s fireworks over the field as “Don’t Stop Believing” plays on Homecoming night or use of actual pyrotechnics in the gym during a basketball game, Carlsbad is truly the epitome of a spirited high school. The sense of community present not only on campus but also in the city as a whole is matched by few others. Even those who choose to not participate in spirited events cannot deny the sense of “Lancer Pride” present across campus. Although the idea of constantly displaying pride for your school can be intimidating, the sheer joy one experiences when they finally step out of their comfort zone is something matched by little else. After all, high school is only four years long and anytime spent sitting by and watching others have a blast is time wasted. So, the next time you feel the urge to bleed purple just go for it. To view some quite impressive instances of CHS school spirit click here. The vibrant purple and white colors, the raging fireworks and the sea of students were gathered in the same area were to be presented the most spirited school in the nation and a $25,000 check to go with it. The student body and their effort to represent who they are have given the school an opportunity to use the money in any possible aspect so that students have the opportunity to strive in all aspects throughout the year. Being in charge for the first time at CHS, Principal Dr. Brockett had never seen anything like it. The deafening cheers from students and the organized dances and events was a memory he would keep from this year. The students who built up a strong reputation upon themselves were to not only have fun but to inspire kids to take part of the white and purple family. The hard work and dedication the student body has committed into to create a welcoming environment have paid off as $25,000 dollars was awarded to the school. 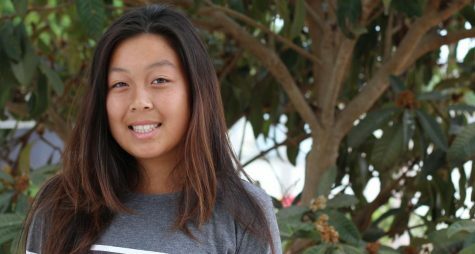 The $25,000 would be used for projects by ASB to provide students with more opportunities to show their school spirit in the most energizing way possible. Having the honor to be presented this award, the school has set the expectations high for incoming freshman and competing schools to keep up with the level of excitement. ASB would have the chance to use the $25,000 reward to further innovate our school spirit to its full potential in the upcoming years so that the students could enjoy themselves and competition would instead look up to the school for student involvement. As the school year comes to a close, seniors file out and incoming students come in, wondering what the new year would be like. For the brand-new high school students and returning students, little is to expect at each event is filled with variant colors and surprising acts from dance to an orchestra. The number of surprises will have more and more students involved with the school and keep the spirit high for years to come.